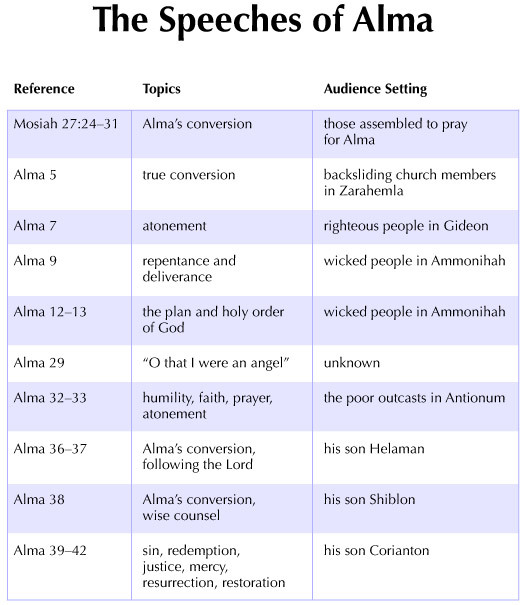 Alma the Younger's first recorded speech (see Mosiah 27:24–31) was the impromptu account of his conversion to the gospel of Jesus Christ. After his conversion, he devoted his life to preaching the gospel to as many people as would listen. These included the righteous, the wicked, the poor, the wealthy, and members of his own family. All of his known speeches or formal statements are cited in this chart, along with the topics and settings of those discourses.